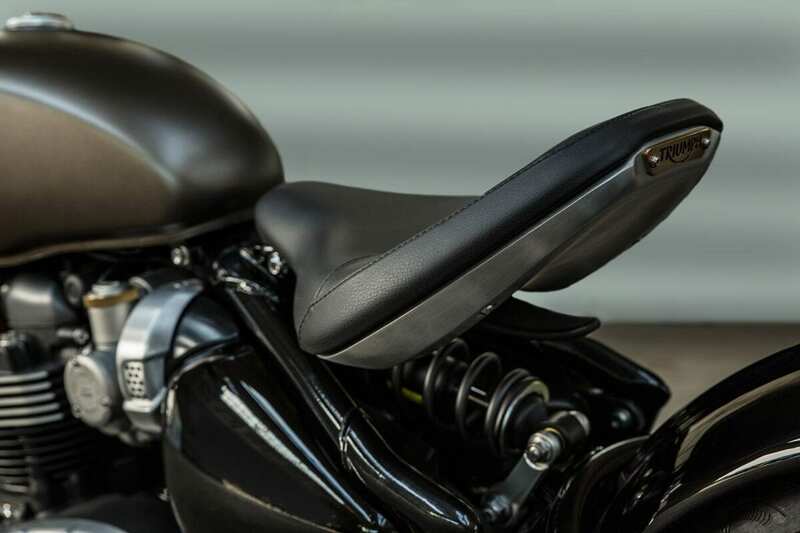 As the custom scene explodes, the classic stripped-back, single-seat, hard-tail look is becoming increasingly popular again. 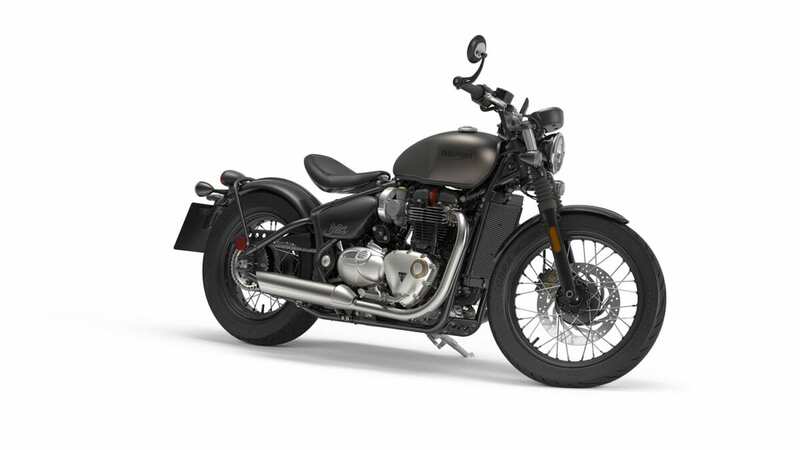 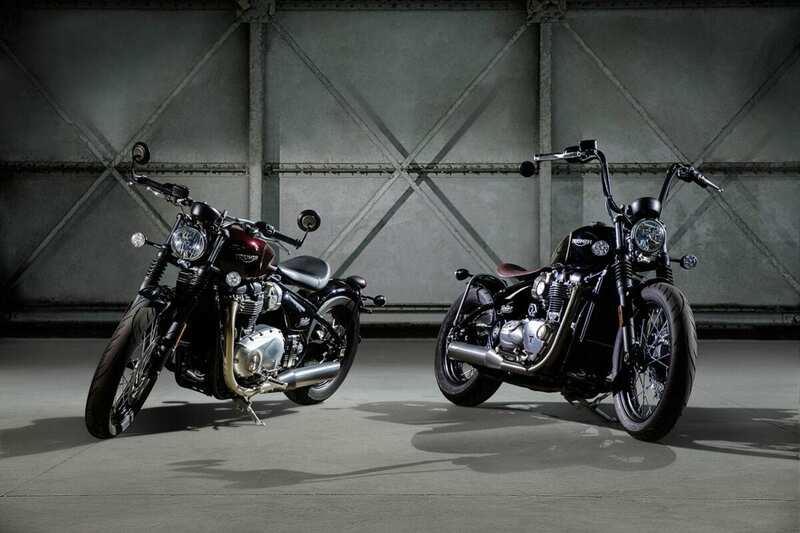 Based on the Bonneville T120, the new Bobber carries wide bars, a minimum of bodywork and cleverly hidden rear suspension. 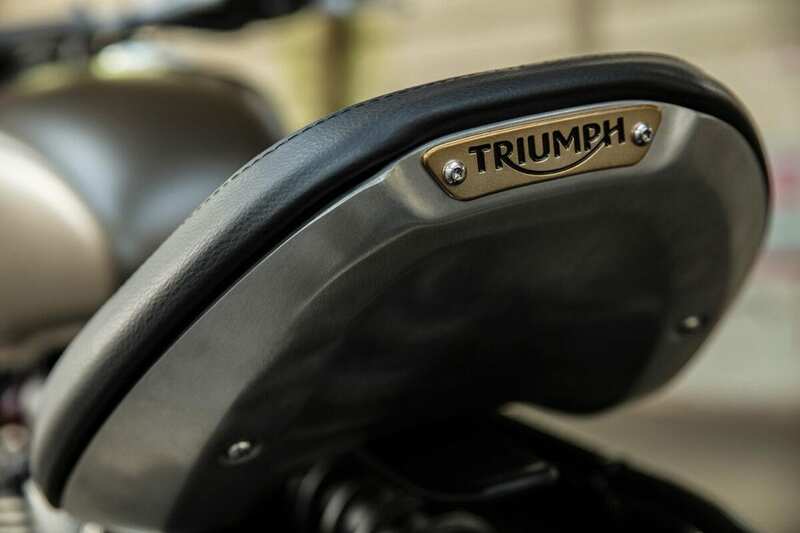 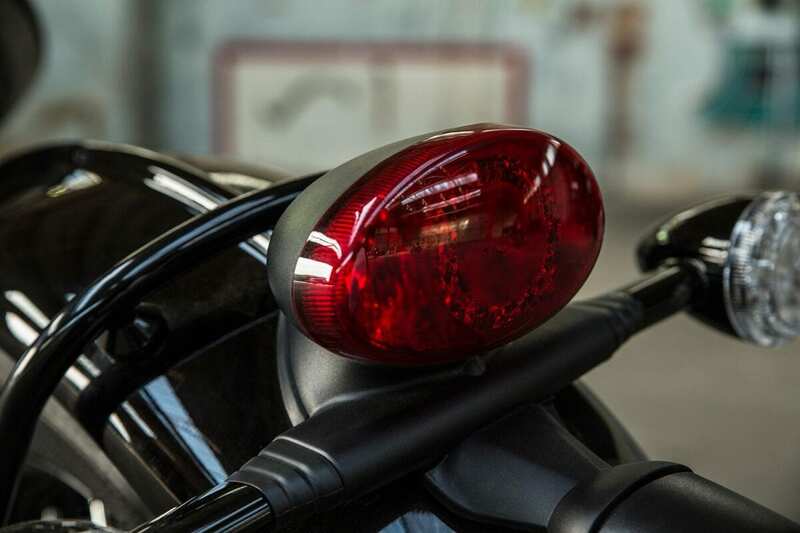 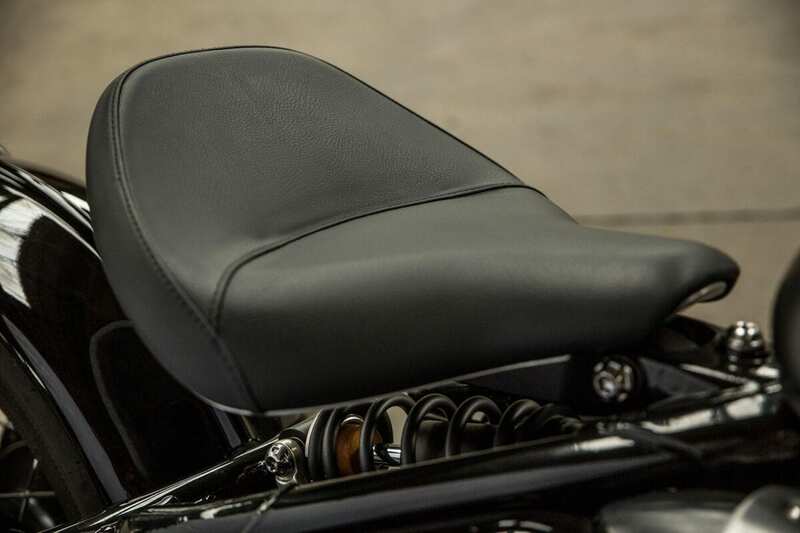 It’s the tail that makes the Bobber so special, with an adjustable, ‘floating’ rear seat that’s heavily padded. 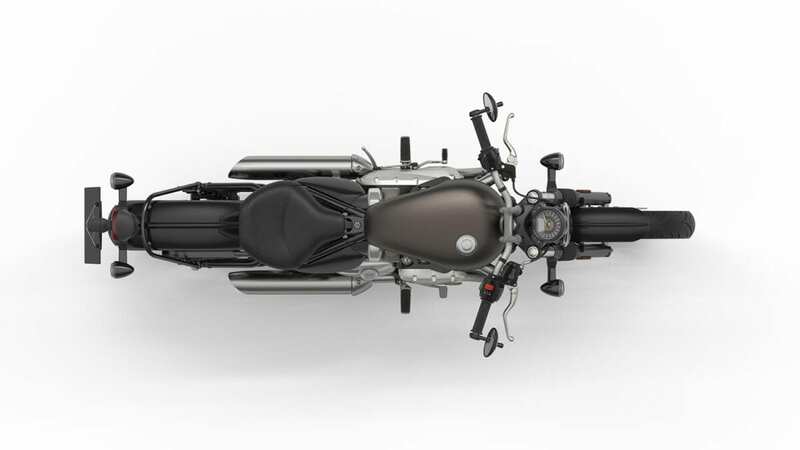 The back wheel is carried in a cage-design swingarm, that looks like a hard tail, but is connected, via a linkage, to the single shock beneath the seat. 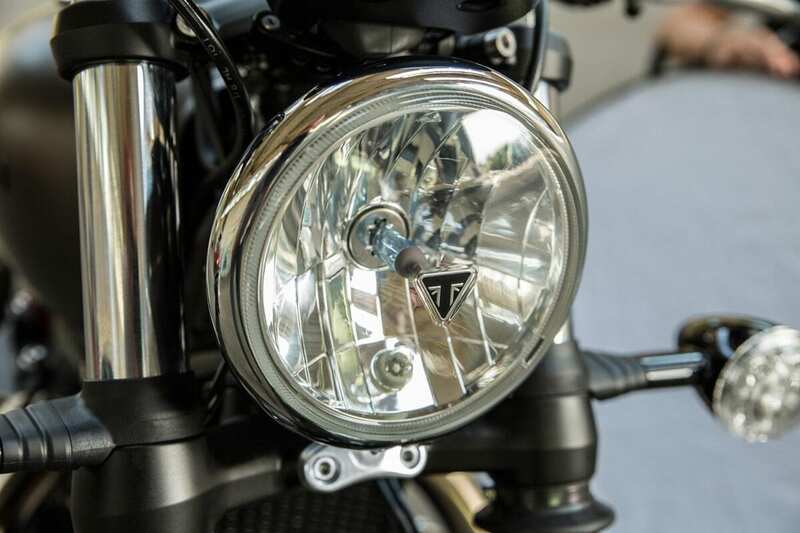 Despite the custom style, key practicalities haven’t been missed – from the paddock stand bobbins on the swingarm to the tilting single clock that provides a view suited to the ‘forward and up’ or ‘back and down’ position selected from the aluminium seat pan. 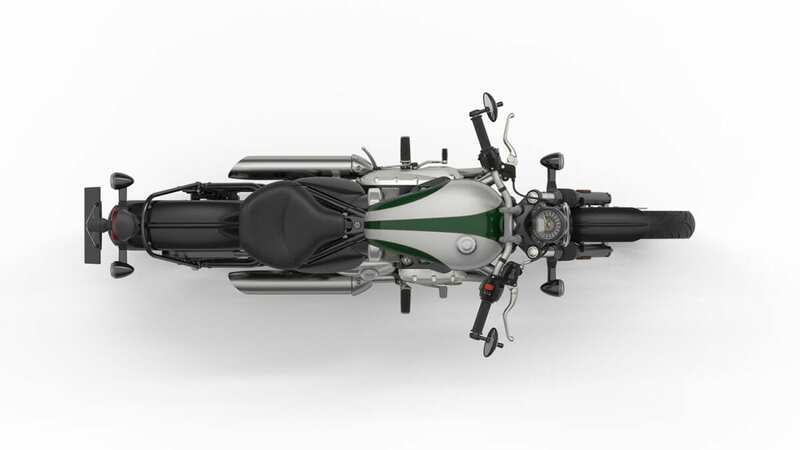 The bike uses the 1200cc High Torque motor of the T120, retuned for increased torque and low-down power. 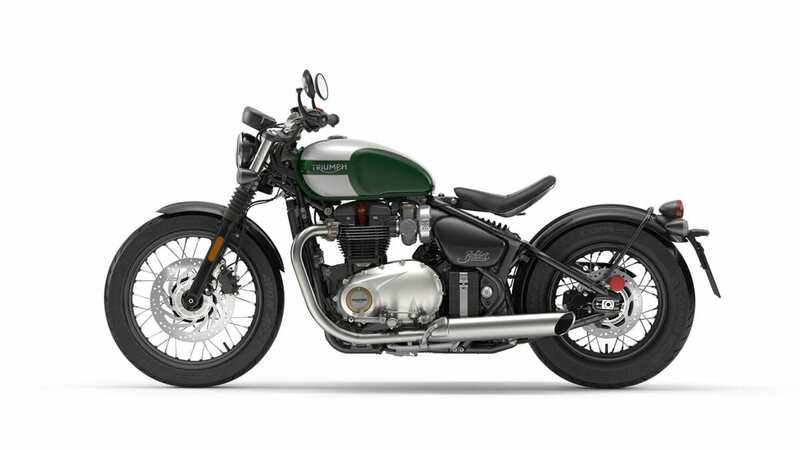 In the T120, the motor makes a healthy 77lb-ft @ 3100rpm, while in the Thruxton R is produces 83lb-ft @ 4950rpm. 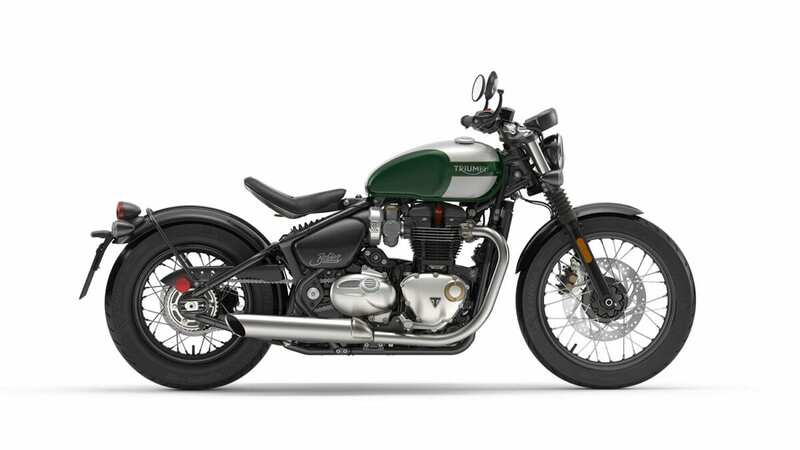 Triumph hasn’t released performance figures yet, but we’d expect it to be somewhere between these two. 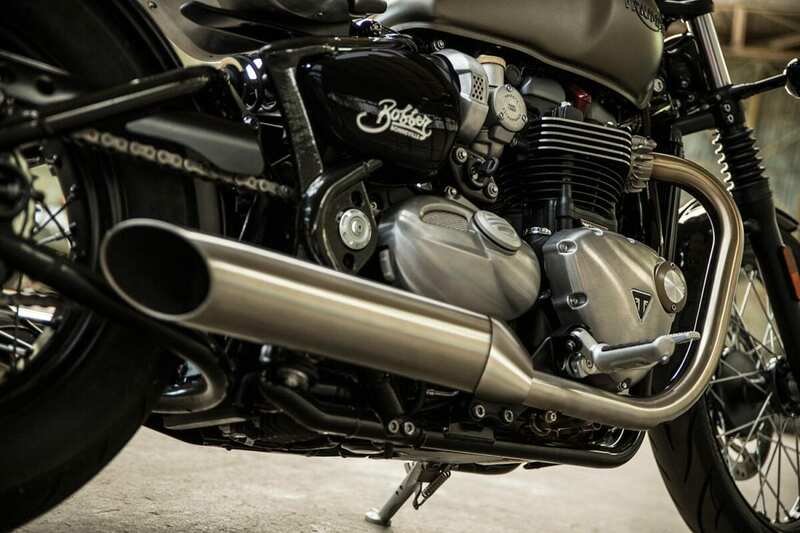 Triumph’s genius twin-walled exhaust returns, the pipes diverting beneath the engine for the catalytic converter. 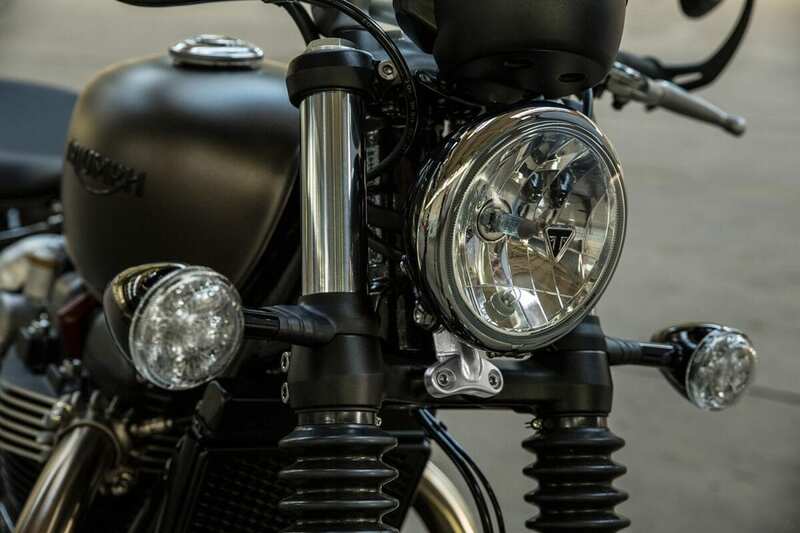 Other modern tech like the ECU, immobiliser and ABS modulator are also cleverly hidden, while details like the carb-style injectors, classic battery box and bar-end mirrors add to the package. 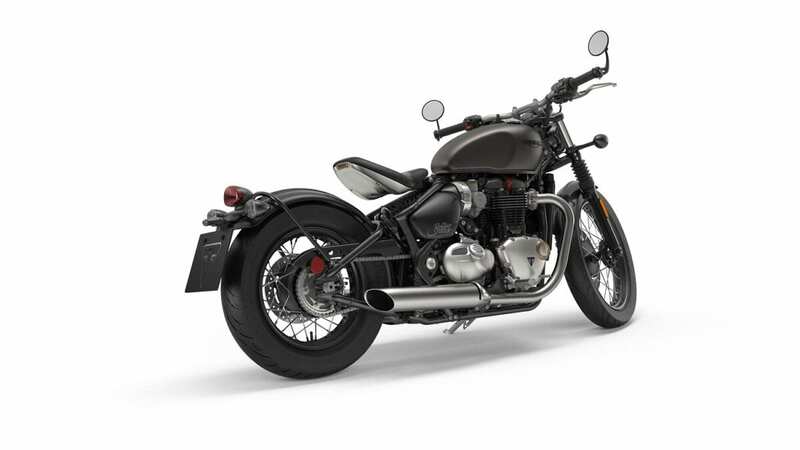 Spoked 19” front and 16” rear wheels carry 100/90 and 150/80 Avon Cobra tyres, with electronics including switchable traction control and two riding modes – Road and Rain. 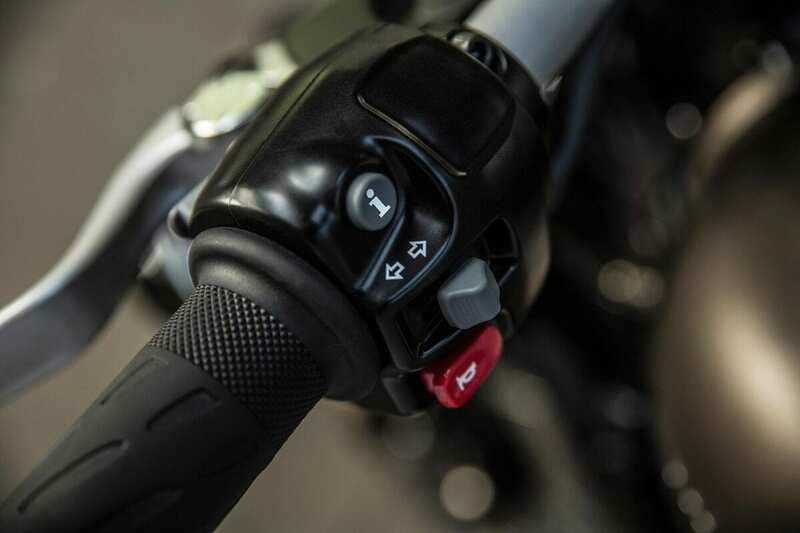 A torque-assist clutch also reduces the lever pull from the cable-operated lever. 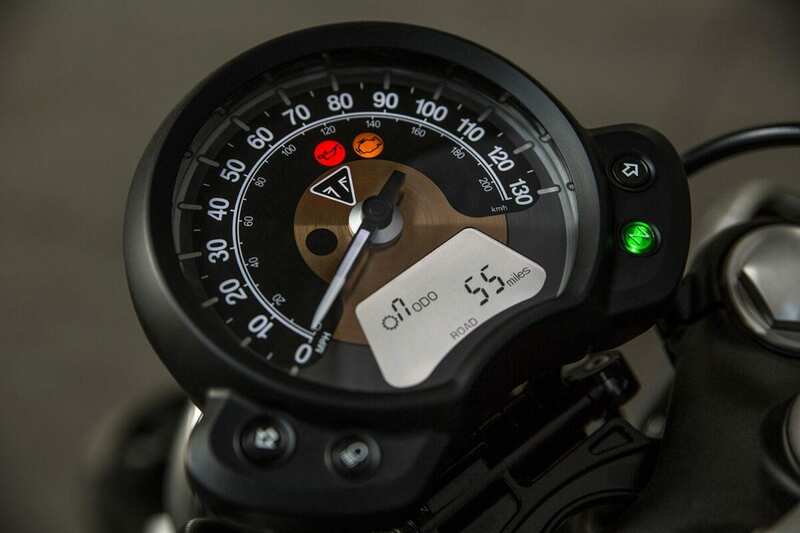 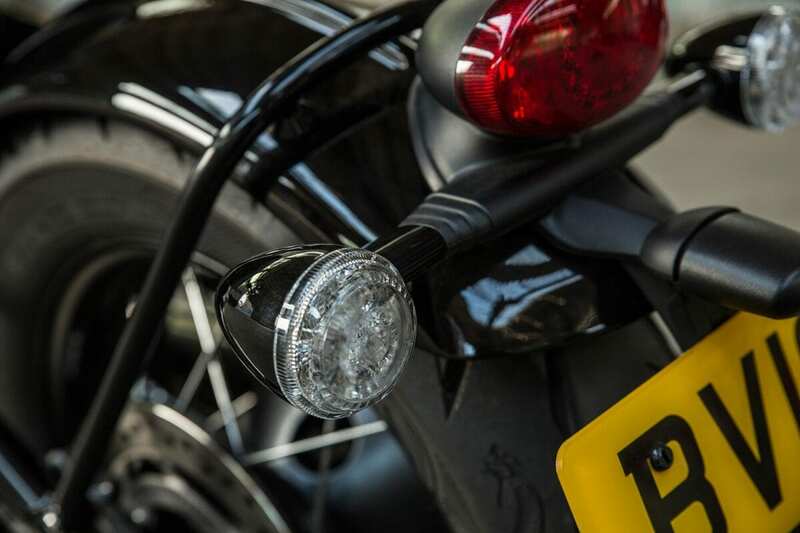 The clock features an analogue speedo, with a small digital display that can show revs, gear position, fuel, clock, trip and odometer plus traction control settings and the status of the optional cruise control and heated grips. 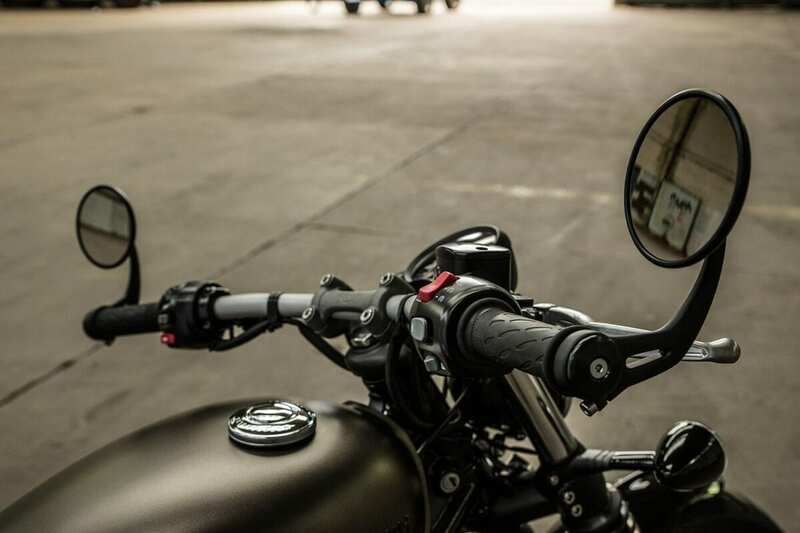 Needless to say, there’ll be a huge range of accessories available, including short and high ape-hanger bars!